When on earth will the Vatican "get it?" Child sexual abuse is a CRIME. This piece, originally published by the Connecticut Post on March 28, 2009, was posted online last April, making it widely accessible. It is no longer available through the CT Post, so I am posting it here for those who have asked. The print version included a huge blowup of one of the key pictures in "Kisses From Dolce," the picture where little Sophia sits on the floor with her teacher and her dog, learning it's OK to tell and that she has done nothing wrong. That the Post team chose that picture told me they understood exactly what this book is all about. I thank the CT Post for bringing my message to so many readers. The story, written by Eileen Fischer, is copyright to the CT Post. Writing for Susan Komisar Hausman, an accountant, was always something she did. Journaling, composing lines of poetry, and crafting essays were part of life for the Connecticut native now living in Stoughton, Mass., where her husband Jonathan, also from Connecticut, is a rabbi. But writing a children's book, and one with a serious subject, was the furthest thing from her mind, she said. Then, three years ago, during one of her frequent visits to Fairfield, where she grew up, Hausman met a sweet Italian greyhound named Dolce, that changed her life. "I didn't think much of it," she said in a phone interview, "but three weeks later I started to hear words in my head and had to sit down and write them." 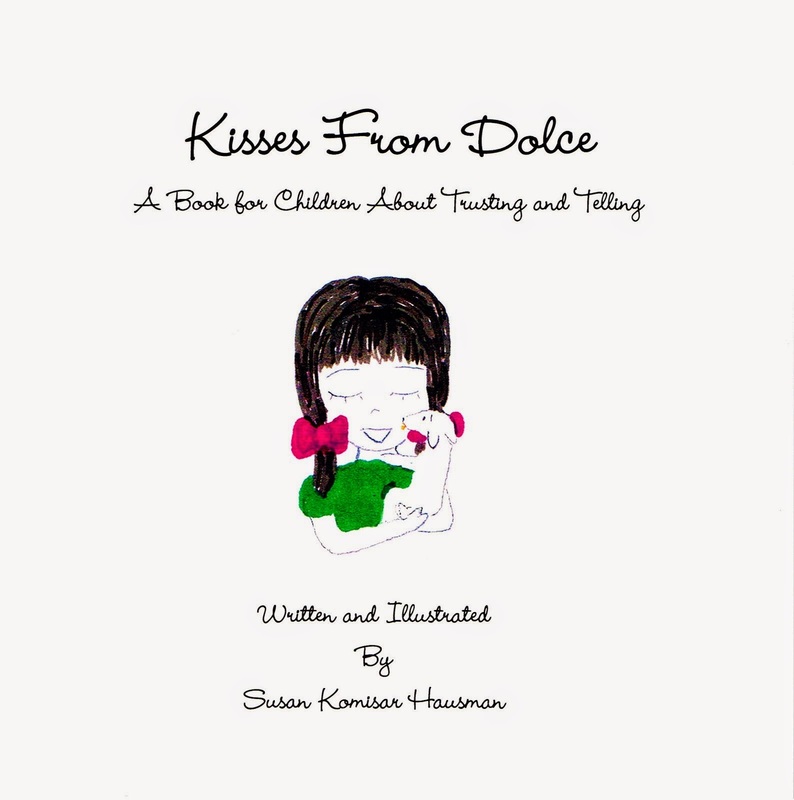 The words became "Kisses From Dolce, A Book for Children About Trusting and Telling" (Trafford, $15.95), which Hausman self-published and wrote all in rhyme. The finished product pretty much turned out to be what she first jotted down, she said. It was an outgrowth, she said, of her work as a facilitator with Darkness To Light, a nonprofit organization based in Charleston, S.C., that believes adults can help stop child sexual abuse and teaches professionals in youth-serving organizations how to recognize and prevent abuse. Sexually abused herself at age 7, Hausman runs about 15 workshops a year, some funded by the Sisterhood at her synagogue, she said. Last year she held her first one in Fairfield. of people have it in their background and haven't come forward about it," she said, pointing out that one out of four girls and one out of six boys are sexually abused before they're 18. "Nothing is going to resolve child sexual abuse, but the point is to mitigate it. "We can make it safe for our kids. Ninety percent of kids are sexually abused by people they know, love and trust. That creates a problem," she said. "Surrounding people don't want to believe that people they know are doing this." One thing the workshops teach is that predators spend a lot of time ingratiating themselves with the children. Caring adults have to keep their eyes open to it, deeming what may be inappropriate. One way it can happen is through mentoring, she said. The one-on-one relationship can be valuable, she said, but how those relationships are set up and where the mentoring takes place has to be monitored. "You can sit on a front porch or with the door open and have one-on-one time," she said. In the book, a little girl named Sophia goes to a day-care center where an Italian greyhound named Dolce comes to class and plays with the children. Sophia loves the little dog, but one day when she comes to school she pushes Dolce away, telling him, "I don't want to be touched." Her teacher offers help, but only when Sophia is ready to talk. Finally, the little girl tells the teacher her secret and Miss Carrie calls the right people to make things better. Weeks go by, but then one day Sophia is smiling and playing again and getting kisses from Dolce. The book is meant to be read by an adult to children, 4 to 8, Hausman said, and has questions at the end for discussion. "Therapists have used it and caregivers who suspect something," she said. "Most kids never tell a soul what's happened to them. There's a sense of loyalty, a sense of shame, all these things conspire to keep kids from telling. "But there are people they can trust to tell and if they tell, things will get better again," she said and that's the lesson Sophia learns. April is Child Abuse Prevention Month. 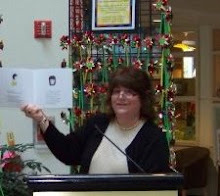 Stacy Karpowitz, a coordinator of outreach and education for the Aetna Foundation Children's Center at St. Francis Hospital in Hartford, has invited Hausman to speak and read from her book at a program for hospital employees and the public on April 15. The center helped more than 450 physically and sexually abused children last year, said Karpowitz, who is also a facilitator for Darkness To Light. She said the book conveys the important message that a child's body is their own and if they do tell about inappropriate touching, they will be helped. Children are afraid that if they tell, and if the police or the Department of Children and Families are called, they'll be taken away. Kids inherently know that telling is going to affect the family in some way, she said. "The teacher in the book doesn't say who she tells and it doesn't convey that the child is in trouble, but that she is very brave," she said. "It's very brave to tell." Todd Bridges spoke recently about being sexually abused as a child and about disclosing that abuse to his father, who, according to Todd, did not believe or support him. It is crucial to listen to a child who is trusting you enough to tell. Most children never tell anyone about their abuse, so when a child does take the risk to disclose, we must stop, listen and, calmly, take action, calling DCF or 911 or both. The odds are the abuser has more victims than the one disclosing to you, so this disclosure might be key in helping many other children. Telling is the beginning of healing and the beginning of justice. It is our job, our adult job, to know how to handle disclosure to keep this child, and probably others, safe from further harm.